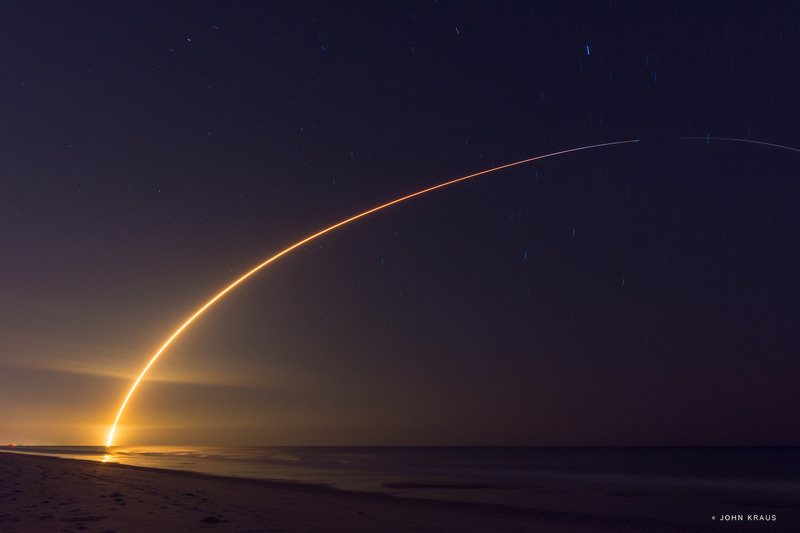 CAPE CANAVERAL AIR FORCE STATION, FL – Spectacular imagery showcasing SpaceX’s Thaicom blastoff on May 27 keeps rolling in as the firms newest sea landed booster sails merrily along back to its home port atop a ‘droneship’ landing platform. Formally known as an Autonomous Spaceport Drone Ship (ASDS) the small flat platform is eclectically named “Of Course I Still Love You” or “OCISLY” by SpaceX Founder and CEO Elon Musk and is expected back at Port Canaveral this week. Check out this expanding launch gallery of up close photos and videos captured by local space photojournalist colleagues and myself of Friday afternoons stunning SpaceX Falcon 9 liftoff. The imagery shows Falcon roaring to life with 1.5 million pounds of thrust from the first stage Merlin 1 D engines and propelling a 7000 pound (3,100 kilograms) commercial Thai communications satellite to a Geostationary Transfer Orbit (GTO). The recently upgraded Falcon 9 launched into sky blue sunshine state skies at 5:39 p.m. EDT from Space Launch Complex-40 at Cape Canaveral Air Force Station, FL, accelerating to orbital velocity and arcing eastward over the Atlantic Ocean towards the African continent and beyond. Relive the launch via these exciting videos recorded around the pad 40 perimeter affording a “You Are There” perspective! They show up close and wide angle views and audio recording the building crescendo of the nine mighty Merlin 1 D engines. Watch from the ground level weeds and a zoomed in view of the umbilicals breaking away at the moment of liftoff. After the first and second stages separated as planned at about 2 minutes and 39 seconds after liftoff, the nosecone was deployed, separating into two halves at about T plus 3 minutes and 37 seconds. Finally a pair of second stage firings delivered Thaicom-8 to orbit. Onboard cameras captured all the exciting space action in real time. When the Thai satellite was successfully deployed at T plus 31 minutes and 56 seconds exhuberant cheers instantly erupted from SpaceX mission control – as seen worldwide on the live webcast. 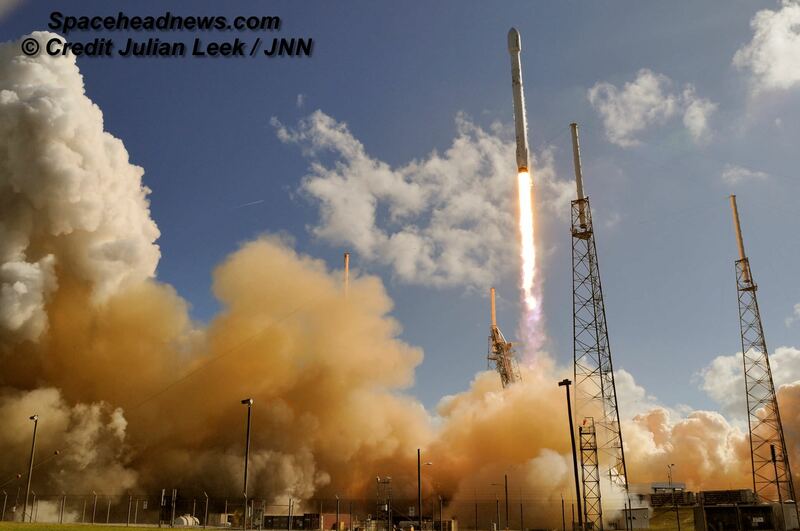 “Satellite deployed to 91,000 km apogee,” tweeted SpaceX CEO and founder Elon Musk. Both stages of the 229-foot-tall (70-meter) Falcon 9 are fueled by liquid oxygen and RP-1 kerosene which burn in the Merlin engines. Less than nine minutes after the crackling thunder and billowing plume of smoke and fire sent the Falcon 9 and Thaicom 8 telecommunications satellite skyward, the first stage booster successfully soft landed on a platform at sea. Having survived the utterly harsh and unforgiving rigors of demanding launch environments and a daring high velocity reentry, SpaceX engineers meticulously targeted the tiny ocean going ASDS vessel. The diminutive ocean landing platform measures only about 170 ft × 300 ft (52 m × 91 m). “Of Course I Still Love You” is named after a starship from a novel written by Iain M. Banks. OCISLY was stationed approximately 420 miles (680 kilometers) off shore and east of Cape Canaveral, Florida surrounded by the vastness of the Atlantic Ocean. Because the launch was target Thaicom-8 to GTO, the first stage was traveling at some 6000 kph at the time of separation from the second stage. Thus the booster was subject to extreme velocities and re-entry heating and a successful landing would be extremely difficult – but not impossible. Just 3 weeks ago SpaceX accomplished the same sea landing feat from the same type trajectory following the launch of the Japanese JCSAT-14 on May 6. The May 6 landing was the first fully successful sea landing from a GTO launch, brilliantly accomplished by SpaceX engineers. With a total of 4 recovered boosters, SpaceX is laying the path to rocket reusability and Musk’s dream of slashing launch costs – by 30% initially and much much more down the road. Thaicom-8 was built by aerospace competitor Orbital ATK, based in Dulles, VA. It will support Thailand’s growing broadcast industry and will provide broadcast and data services to customers in South Asia, Southeast Asia and Africa. Thaicom-8 is the fifth operational satellite for Thaicom. It now enters a 30-day testing phase, says Orbital ATK. The Falcon 9 launch is the 5th this year for SpaceX. 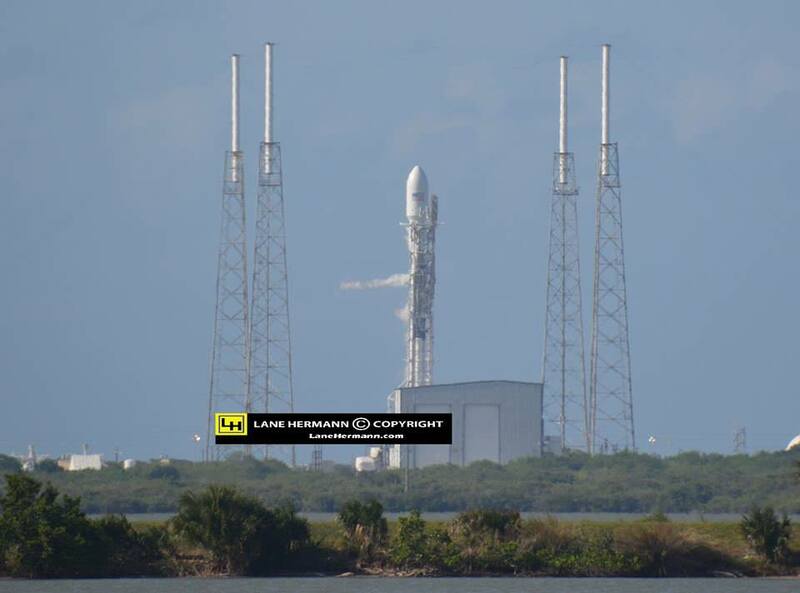 Watch for Ken’s continuing on site reports direct from Cape Canaveral and the SpaceX launch pad. 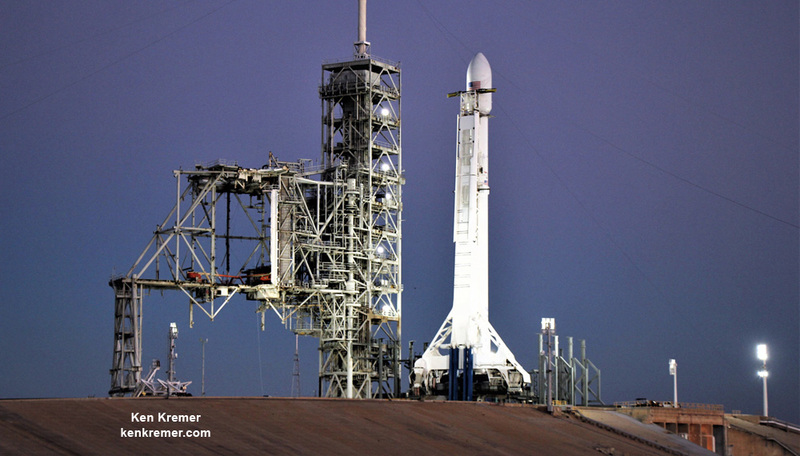 What’s Ahead for Recovered SpaceX Falcon 9 Booster? Now that SpaceX has successfully and safely demonstrated the upright recovery of their Falcon 9 booster that flew to the edge of space and back on Dec. 21 – in a historic first – the intertwined questions of how did it fare and what lies ahead for the intact first stage stands front and center. A “significantly upgraded” SpaceX Falcon 9 rocket stands erect on the Florida space coast today, Sunday, Dec. 20, and is poised to make history Monday evening (Dec. 21) with a spectacular nighttime blast off and daring first ever surface landing attempt of the boosters first stage at Cape Canaveral Air Force Station, that could be accompanied by sonic booms – if all goes well. Dec 20 Update: SpaceX CEO Elon Musk has just scrubbed for the day and reset launch to Monday, Dec. 21 and story is revised. KENNEDY SPACE CENTER, FL – A SpaceX Falcon 9 rocket and Dragon cargo ship loaded with critical supplies for the International Space Station (ISS) were destroyed by a catastrophic explosion starting approximately 148 seconds after a successful blastoff today, June 28, from Space Launch Complex 40 at Cape Canaveral Air Force Station in Florida at 10:21 a.m. EDT. “Eastern Range confirms the Falcon 9 and Dragon vehicle broke up,” according to the USAF Eastern Range, 45th Space Wing as the vehicle was in flight and the first stage was firing. The failure was immediately obvious to all of us watching the launch live on site from the Kennedy Space Center press site when the rocket disappeared into a expanding white cloud that was totally abnormal. See my launch and explosion photos herein. “At this point, it’s not clear to the launch team exactly what happened,” NASA Launch Commentator George Diller reported on the live NASA TV broadcast. It was the third launch failure of a cargo delivery run to the space station in the past half year -including both American and Russian rockets. The Falcon 9 stopped ascending and broke apart and an abnormal vapor streak formed ahead of the rockets planned ascent path to orbit. Within moments falling debris was visible in eyewitness photos from multiple angles. “Falcon 9 experienced a problem shortly before first stage shutdown. Will provide more info as soon as we review the data,” tweeted SpaceX CEO Elon Musk soon after the explosion. The pressurized section of the Dragon was packed with over 4,000 pounds of research experiments, spare parts, gear, high pressure supply gases, food, water and clothing for the astronaut and cosmonaut crews comprising Expeditions 44 and 45 on the ISS. Watch for Ken’s continuing onsite coverage of the CRS-7 launch from the Kennedy Space Center and Cape Canaveral Air Force Station. SpaceX successfully launched their commercial Falcon 9 rocket and Dragon cargo ship on a critical mission for NASA bound for the space station this morning, Jan. 10, while simultaneously accomplishing a hard landing of the boosters first stage on an ocean-floating “drone ship” platform in a very good first step towards the bold company goal of recovery and re-usability in the future. The spectacular night time launch of the private SpaceX Falcon 9 rocket lit up the skies all around the Florida Space Coast and beyond following a flawless on time liftoff at 4:47 a.m. EST from Cape Canaveral Air Force Station. The nine Merlin 1D engines of the 208 foot-tall Falcon 9 generated 1.3 million pounds of liftoff thrust as the rocket climbed to orbit on the first SpaceX launch of 2015. The Dragon CRS-5 mission is on its way to a Monday-morning rendezvous with the International Space Station (ISS). It is loaded with more than two tons of supplies and NASA science investigations for the six person crew aboard the massive orbiting outpost. SpaceX CEO Elon Musk quickly tweeted that good progress was made, and as expected, more work needs to be done. This was an experiment involving re-lighting one of the first stage Merlin engines three times to act as a retro rocket to slow the stages descent and aim for the drone ship. “Rocket made it to drone spaceport ship, but landed hard. Close, but no cigar this time. Bodes well for the future tho,” Musk tweeted soon after the launch and recovery attempt. Musk’s daring vision is to recover, refurbish and reuse the first stage and dramatically reduce the high cost of access to space, by introducing airline like operational concepts. The ‘autonomous spaceport drone ship’ was positioned some 200 to 250 miles offshore of the launch site in the Atlantic Ocean along the rockets flight path, flying along the US Northeast coast to match that of the ISS. The autonomous spaceport drone ship measure only 300 by 100 feet, with wings that extend its width to 170 feet. That’s tiny compared to the Atlantic Ocean. Therefore the SpaceX team was successful in accomplishing a rocket assisted descent and pinpoint landing in the middle of a vast ocean, albeit not as slow as hoped. No one has ever tried such a landing attempt before in the ocean says SpaceX. The company has conducted numerous successful soft landing tests on land. And several soft touchdowns on the ocean’s surface. But never before on a barge in the ocean. So they will learn and move forward to the next experimental landing. 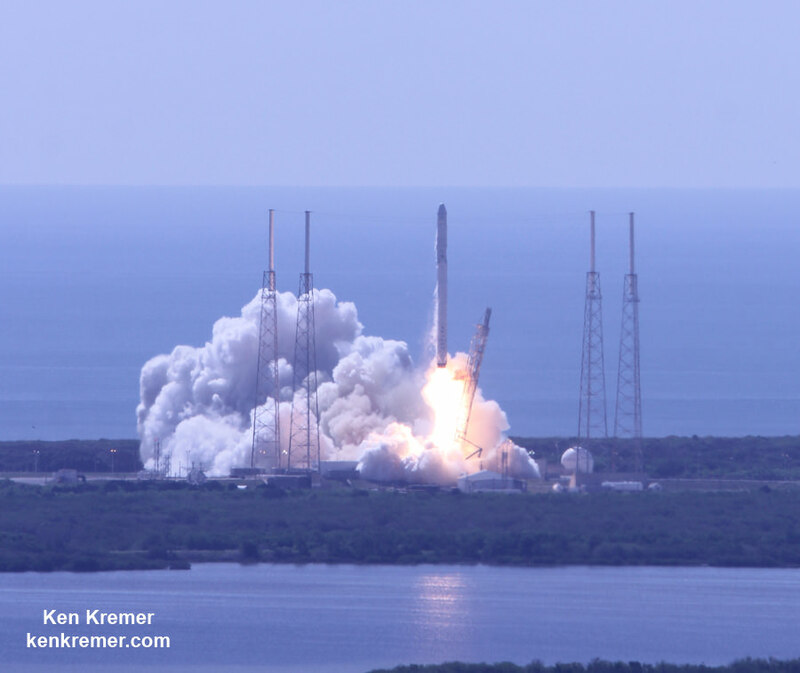 CRS-5 marks the company’s fifth resupply mission to the ISS under a $1.6 Billion contract with NASA to deliver 20,000 kg (44,000 pounds) of cargo to the station during a dozen Dragon cargo spacecraft flights through 2016 under NASA’s Commercial Resupply Services (CRS) contract. “We are delighted to kick off 2015 with our first commercial cargo launch of the year,” said NASA Administrator Charles Bolden in a statement. The launch marked the first US commercial resupply launch since the catastrophic destruction of an Orbital Sciences Antares rocket and Cygnus Orb-3 spacecraft bound for the ISS exploded unexpectedly after launch from NASA Wallops, VA, on Oct. 28, 2014. The US supply train to the ISS is now wholly dependent on SpaceX until Cygnus flights are resumed hopefully by late 2015 on an alternate rocket, the Atlas V.
Video released today by SpaceX confirms the landing legs deployed successfully on the Falcon 9’s first stage booster, paving the way for future vertical soft touchdowns on land. 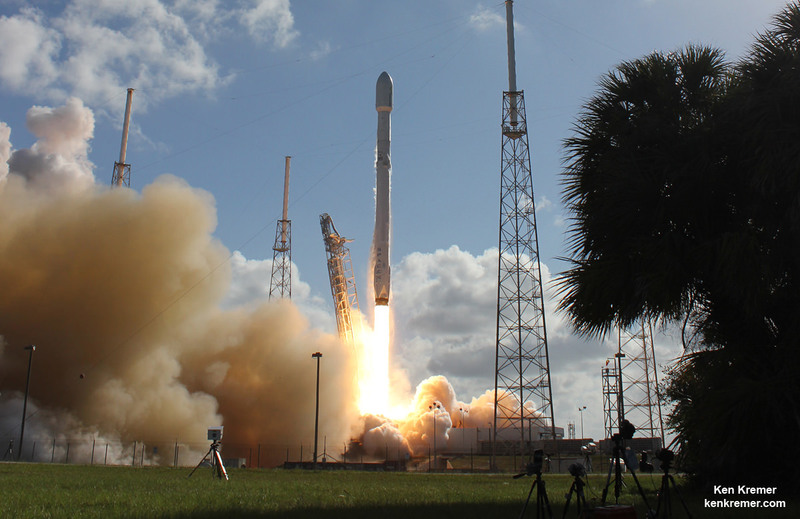 SpaceX’s next-generation Falcon 9 rocket was tested following the launch of the CRS-3 mission for the Dragon spacecraft, which launched from Cape Canaveral Air Force Station on April 18. This was the first test of the landing legs deployment with a re-entry burn and soft landing in the Atlantic Ocean. The SpaceX CEO had mentioned the success during a post launch briefing and later tweeted further updates that the Falcon 9 first stage actually made a good water landing despite rough seas, with waves swelling at least six feet. He also spoke briefly of the success during a news conference at the National Press Club on April 25, saying video would be released soon. The video above is actually a cleaned-up (repaired) version of the original. There are a short few frames which show the landing legs deployed just before splashdown, which Musk highlighted in a recent Tweet. Obviously this is not the greatest-quality video ever released, but exciting still the same. SpaceX is actually looking for help in cleaning up the video even further.